These California sea lions bulky enough for you? 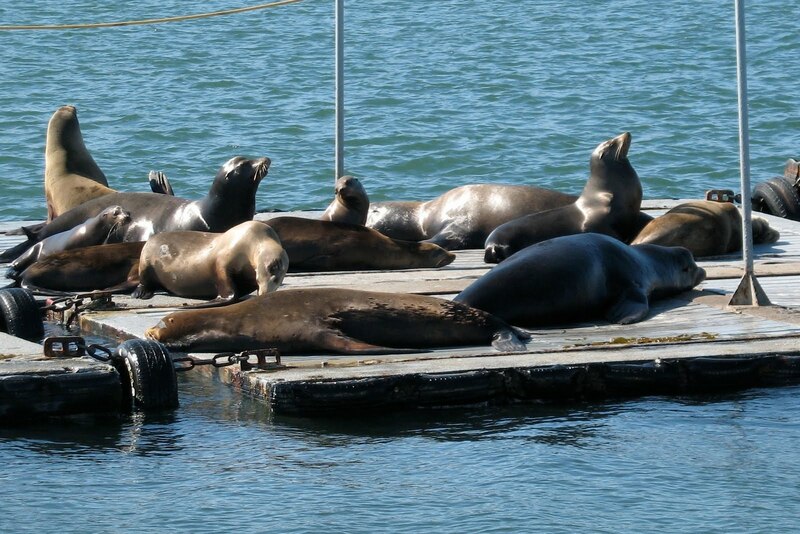 They are for me and these fellows were sunning themselves on some floating docks in San Diego harbour when we took a harbour tour last year. It is pretty amazing to me that they can lift all that bulk out of the water and onto the dock but they do manage with relative ease. Click to see a little more detail, if you wish. Grey skies and falling rain was the prediction for today and sure enough that’s what we awoke to this morning. However as the morning progressed the rain stopped but the mist hovered around the ship. Not so great for photography, although I did snap some photos of the scenery as we passed. By the time we arrived in Juneau, the capital of the state of Alaska, the weather had lightened considerably. Juneau, a city that is home to 30,000 people, is situated on a strip on land bordered by the water the saltwater Gastineau Channel on one side and the mountains and the Mendenhall Glacier on the other. So, although there are roads within the borough, it is inaccessible except by air or sea. Of course gold was the reason for its foundation around 1880 and mining propelled its growth until World War II when it became uneconomical to continue production. in Hawaii or Mexico. Since the food there is so scarce for the whales they basically go five months without food and by the time they have arrived back in Alaska they have lost 40% of their considerable weight which is normally 35 tons for a female, with their average length being 49 feet. Humpback whales do not have teeth but baleen, which hangs from the roof of their mouths like vertical blinds. They gulp huge amounts of water which they then express through the baleen leaving behind the trapped fish and krill which they then swallow. During the summer feeding season they may consume over a ton of food a day. But back to our humpback whale who was blowing and preparing to dive. They blow six or seven times and then on the last blow they hump their backs finally displaying their flukes or tail and then dive deeply for five to ten minutes to feed before they resurface to breath. All this our whale did several times while we stopped and watched. After a half hour we continued on our way, passing the various islands in the channel and seeing the most gorgeous rainbow, which I duly photographed. The channel is filled with large and small islands and the scenery was beautiful even though it was partly overcast with a watery sun breaking through every now and again. During one of the sunny periods we came across a favourite haul-out place for Steller sea lions where fifty or so were lying around on the rocks, sunning themselves with lots of jockeying for the best position. Nearby, perhaps thirty feet away, was a dead sea lion and standing on the rock above was a bald eagle along with an immature one, who no doubt had been feeding on the carcass. A mature bald eagle is a magnificent looking bird while a young one is a rather large bird of an all over mottled brown colour which they retain until they are four or five years old. They mate for life and nest in the same nest every year, which they add to each year and over time becomes very large. One of the islands in the channel is known to have over 900 bald eagle nests along the shoreline as well as a huge population of brown bears, which are sadly very shy and we did not see any as we passed by. On our return to the dock we again passed our humpback whale and stopped to watch it for a while but that was the sum total of our wildlife watching for the day, some bald eagles, some Steller sea lions and a humpback whale. However I did enjoy the experience, for I am very easily pleased by an afternoon on the water and the sight of a few animals or birds in the wilderness, which Alaska surely is. At the dock we boarded a bus for the Mendenhall Glacier, which is a few miles out of the centre of Juneau. By this time the rain had returned so we bundled up to visit the glacier and the excellent visitor centre. This glacier, which is 1 1/2 miles wide and 150 feet high at the face, arises in the Juneau Ice Fields which span both Alaska and British Columbia. It is 12 miles long and it takes 80 years for a section of the glacier to travel these twelve miles. Like most glaciers in Alaska it is receding even though 100 feet of snow fall annually on the ice fields. We toured the visitor centre and watched an interesting short film about this famous glacier.